It is just too hard to believe… some of the old news items – – that one will find – – when they take the time to look through old boxes of memories. This “NEWS” of the day – – January of 1967 – – my husband, Lee passed away – – and in this clipping – – we see the “Chief of Police Curtis Brostron” crown Miss Carol-Lynn Howard … the Lily Day Queen. This ceremony took place at City Hall – – to mark the opening of the 1967 Easter Seal campaign of the St. Louis Society … for Crippled Children. The above news story was just above the story in the ‘newspaper clip’… that is posted above this one. 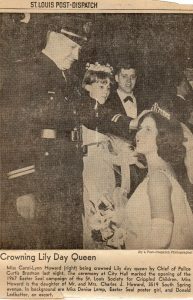 Before “Chief Brostron” becoming ‘Chief” – – he and my husband, Lee Aldrich were riding partners on the St.Louis Police Department – – and very good partners – – if I say so myself. – – So with me knowing “Mrs. Susan L. Cost” – – and her story right below the “Chief’s” story – – just had to clip and save – – and with all kinds of memories – – to remember …”Lee” – – this was the week to find this old news – – and with the computer and “fourgrandmas.com” – – just had to let the whole wide world know… and remember if they remember either one of these fine people? Posted in Childhood, Family, Grand-Children, Grandma, Today and tagged "Chief of Police Curtis Brostron", "Detective Lee Aldrich"with 2 comments. I’m trying to find out more about the St Louis Society for Crippled Children. When, in fact, was it formed? The unofficial beginning, the official beginning, who started it etc. Kindly remember that the newspaper clip above is 50 years old.